There are, thankfully, a lot of options for women when it comes to birth control, giving women the chance to pick a method that's best for them. And according to a new study, women in abusive relationships are most likely to pick birth control options that are easier to keep secret — a revelation which has some obvious and concerning implications. 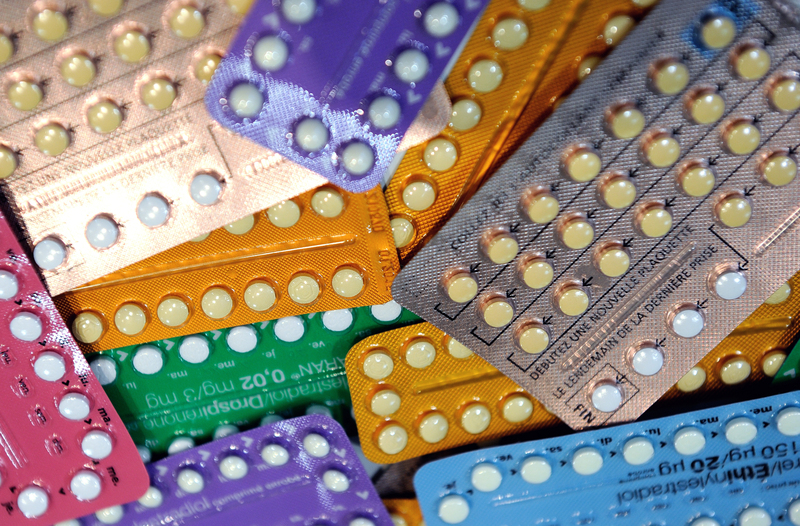 According to the study, which was conducted by four professors from McGill University and published by the Public Library of Science, being in an abusive relationship has a definite effect on the birth control method a woman is most likely to select. Women in abusive relationships are less likely to use birth control at all, but when they do, they most frequently choose options that are easier to conceal and more difficult to interfere with, such as IUDs or hormone injections. Although it isn't talked about as much as it should be, reproductive abuse (or reproductive coercion, as it is also known) is a disturbingly common phenomenon in which a partner tries to use bullying or intimidation in order to convince a woman to have a baby. The abuser might even interferes with various birth control methods — poking holes in a condom, for instance, or flushing away a woman's birth control pills. Forcing a woman to get pregnant can be a way of tying her to you forever through a shared child. It is also a means of exercising total control over a woman's body, making it so that she cannot even control her own reproductive life. In fact, some abusers have been known to pressure women to get pregnant and then pressure them to abort. No matter what the reasons, whether the abuser wants a child or not, reproductive coercion is about control. In other words, it's not surprising that women in abusive relationships would be more likely to want more "discrete" methods of birth control such as IUDs that are more difficult for someone to interfere with — and easier to conceal if your partner doesn't want you taking birth control. And although it's harder to say for certain why women in abusive relationships are less likely to be on birth control at all, the disturbing possibility that someone is preventing them from doing so does come to mind. Also troubling is the fact that more discrete means of birth control can also be more expensive. IUDs, for instance, last for years, but come with a higher up-front cost that may be prohibitive for many women looking for that option. Even beyond that, of course, the idea that a woman would ever be forced to make choices about her own healthcare based not on what's medically best for her personally but out of fear of an abusive partner is not okay. And yet this study implies that that is exactly what is happening. Clearly we have a long way to go when it comes to equalizing access to reproductive healthcare for women. And making sure that some of the women most in need of it also have that access needs to also be part of the fight.